How to accept gift cards in a system not yet supported by Gift Up! If you use some software not yet supported by us, you can get started right away with accepting the Gift Up! issued gift cards. The "Some initial effort, but no ongoing effort" approach! This approach means you can get setup straight away and have to do a little work every time you sell a gift card. This approach is really good for lower or unknown volume gift card sales. When that is done your customer can, in effect, use his/her gift card balance against an order in your e-commerce store. We usually recommend that you put something in your gift card terms that says "please allow 24 hours before gift card is active in our online store", or something to that effect. Create an "$50 Gift Card" item in Gift Up! Whenever we sell a $50 Gift Card for you, we'll issue a code to the customer from that pool of 10 codes you just gave us. And because has already been created in your store, it will work instantly. We recommend not turning on the ability for your customers to buy custom value gift cards for the simple reason that those gift cards cannot have codes allocated against them in advance (we generate a code whenever a custom value gift card is sold, thus it will not work automatically in your external software system!). 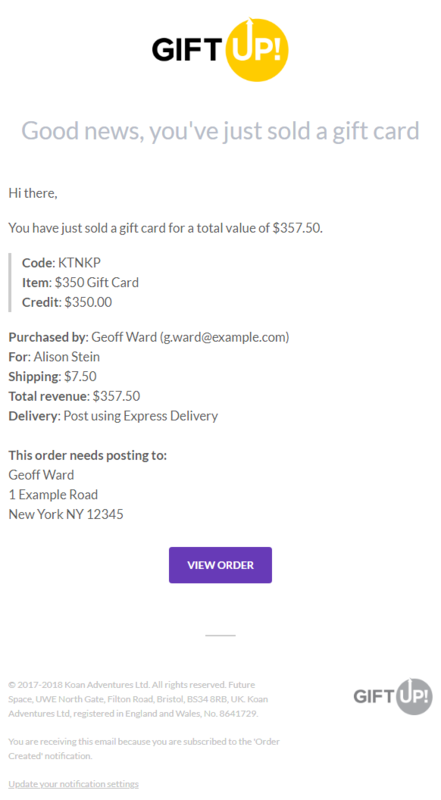 By default you'll be notified about all gift card sales, here's an example of one (it's for a postal order, but for email gift cards, the only thing that gets removed is the address). Notice how it contains the code we issued to the recipient and the initial credit value.